A range of mould inserts for use in VRTM and RTM tooling. Some inserts are designed to be directly laminated into composite tooling and some are specifically for use in metal tooling. 6mm pipe or as mould flange vacuum connection (see XA-0304). Insert for flange vacuum connection. To accept vacuum GEKA connection. To be laminated into composite moulds. Liner used in conjunction with 3/8” BSP Vent insert to reduce vent diameter, for use with 6mm Delrin pipe. Blank Delrin fitting for use with 20mm Mould Insert XA-0014. Supplied with 3/8” BSP female port, but no through hole. This can be drilled by customer to suit requirements or used as blanking plug. Insert to accept vacuum catch pot or injection port pipe insert. Machined Delrin insert to block Air ejector insert XA-2001 if not using the Air Ejector XE-0020. Machined steel insert to suit Air Ejector XE-0020. To be laminated into composite moulds. Fitting is included with Air Ejector XE-0020. Use in conjunction with 20mm Mould Insert XA-0014 to connect a 6 mm injection or vent pipe to mould. 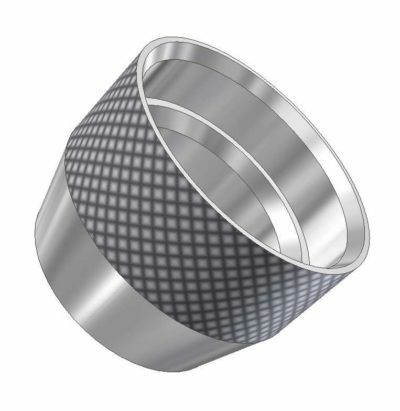 Use in conjunction with 20mm Mould insert XA-0014 to connect a 10mm injection or vent pipe to mould. Spare seal inserts are available part ref: MM-0010. upper and lower mould surfaces. Includes M8 x 50 socket cap bolt and nut.